Got questions? Check out our forum on warmfly.org for discussion on the contest. Also check out our Facebook page. February 26th meeting - Ricky Yeldell and more! We have a big agenda on tap for this month, so please make every effort to come out! For starters, we'll have one of our favorite guest speakers back. Ricky Yeldell was LDWF's managing biologist for Toledo Bend. Although retired, Ricky keeps his finger on the pulse of all things Toledo Bend. He'll give us an update from his last presentation two years ago, as well as insight to where to find lunker bass, crappie and other species. After Ricky's talk, we'll give an update on the Little Missouri River. Our annual "March Brown" club trip is just a couple weeks away. Finally, Bill Morrison and Gene Taylor will discuss the club's first-ever "Mixed Bag" tournament which kicks off March 1st. This free entry, members-only, CPRO (catch-photo-release optional) competition is different than most others. Instead of biggest fish wins, it's most species wins. And the biggest winner is the lucky member who didn't place but gets their name drawn from all entrants. 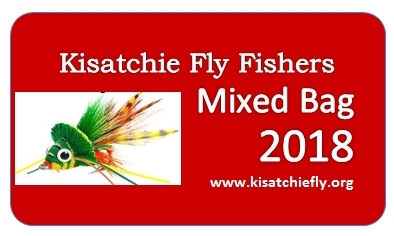 Check the "Mixed Bag" page on the menu above for more details. This month we'll tie the Gurgler. Created by the late Jack Gartside, the Gurgler is one of the universal patterns that has caught nearly everything from bream to tarpon. The Gurgler is a surface fly that pushes water and gives the general appearance of a variety of prey, from hoppers to frogs to baitfish. 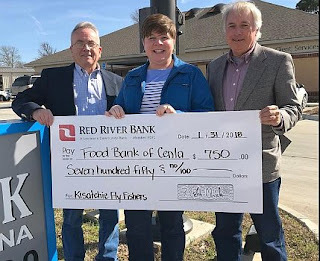 KFF makes donation to Food Bank! 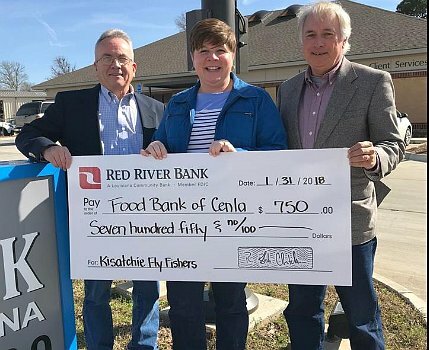 Last Wednesday, Richard Hudson and Catch Cormier presented a check on behalf of the Kisatchie Fly Fishers to The Food Bank of Central Louisiana. Accepting on behalf of FBCL was Jayne Wright-Velez and Linda Hutson. 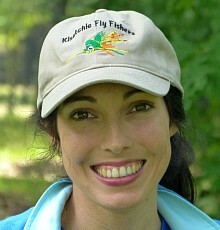 The money was generated from our fundraiser during the recent Cenla Fly Fishing & Light Tackle Festival. This donation will help feed five seniors for a whole year! We wish to thank all of our generous benefactors who made our Festival a success and this donation possible. 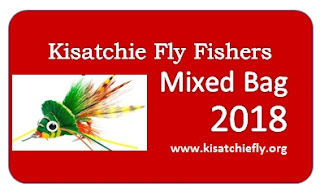 Red Alert Lures, Maria's Farm Products, Rogers Custom Rods, Lil Boos Hardware & Sporting Goods, Red River Bank, the City of Pineville, and all the fly tiers and KFF members who donated stuff or gave their time at the Fest to help out.